The Food Standards Agency has introduced a Food Hygiene Rating system, whereby all food-producing and selling establishments are given a ‘hygiene rating,’ following an inspection from a local authority food safety officer. Under the scheme, businesses are ranked from 0 – 5, taking into account how the food is prepared, cooked, cooled and stored, as well as the condition of the premises. 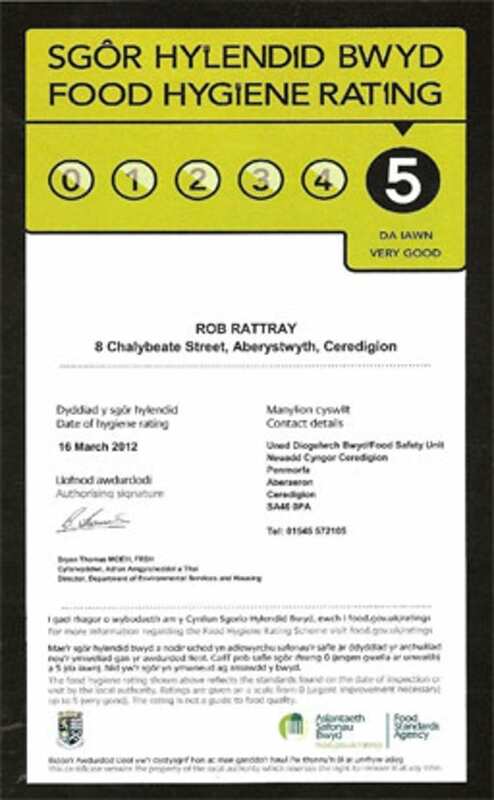 At Rob Rattray Butchers, we are very proud to have been awarded the maximum Hygiene Rating of 5, or ‘Very Good’ in both the retail Shop and at our Butchery Unit; you can easily see this declared by a prominent sticker in our window, and in a framed certificate inside the shop and at the Unit. We are absolutely committed to the welfare of our customers, and so take impeccable care over every aspect of food hygiene and safety in our business. All of our staff are fully trained in the latest advice and regulations, and Rob has achieved level 4 (Advanced) Certificate in Food Safety and Hygiene. We were proud to be considered exemplary in the way we run our business, we were chosen by the Food Standards Agency to present a short film guide for butchers, advocating best practice hygiene and food safety. "My participation in this film, together with my Advanced Food Hygiene training has contributed to my awareness of food safety and my ability to maintain day-to-day hygiene standards within the business"